Discount Car & Truck Rentals rents cars and light trucks for business or leisure rental. Discount has over 300 locations across Canada. Discount Car & Truck Rentals have a strategic partnership with Petro Canada, which provides Discount with thousands of gas savings cards at Petro locations. Discount Car & Truck Rentals wanted to spread joy to potential customers of both during statutory holiday weekends, giving away free gas for the weekend. Fervent & Discount devised a plan to visit multiple Petro Canada locations on holiday weekends. Each weekend Fervent Events brand ambassadors would be in a branded Discount truck and spend 30 minutes at 10-20 Petro Canada locations, on Thursday before the weekend, and give away free gas cards. 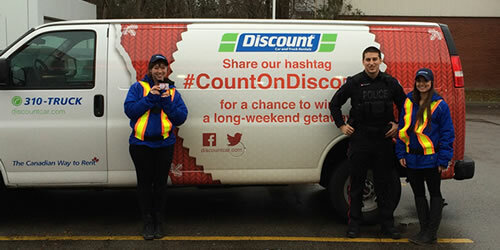 If customers tweeted #CountOnDiscount they would be entered to win a Canadian getaway package. Fervent provided liability insurance for each gas station and reps sent live photos to Discount to tweet throughout each activation. Total of 105 gas stations visited in Toronto, Brampton, North York, Mississauga, Halifax, Ottawa and Calgary. Photos & Videos generated for future marketing collateral.